In keeping with my 2013 goal of random acts of kindness, I decided Tu B’Shevat was a perfect occasion to send an unexpected surprise to an old friend. For those of you who have never been to Seattle, there is an awesome sculpture under a bridge known as the Fremont Troll. It’s a local landmark. 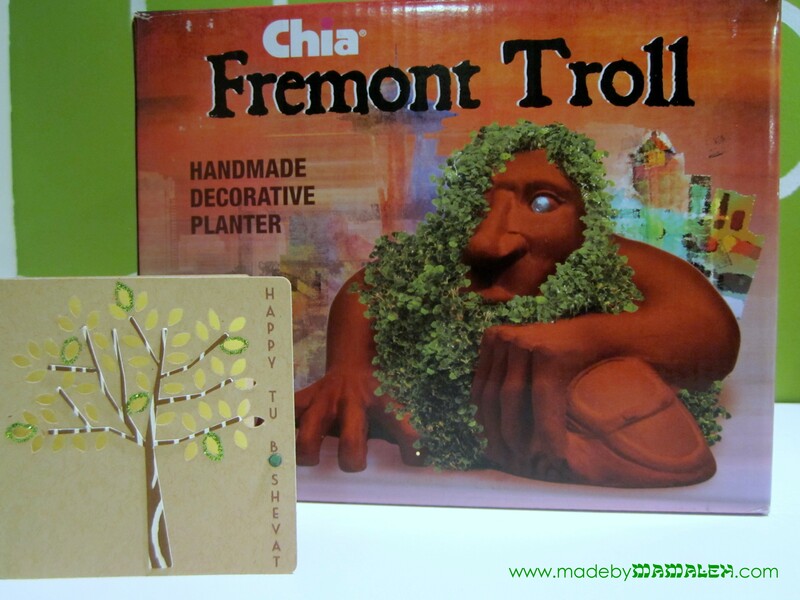 So, I was totally amused to find a Fremont Troll Chia Pet in my wanderings and just knew I had to get it for someone. It struck me as especially fun to send to a friend who used to live in Seattle but is now halfway across the country. I thought she’d get a real kick out of it and come on, a Chia Pet for Tu B’Shevat, how awesome is that? Of course, I had to make a cute card to go along with it and decided this would be the perfect opportunity to challenge myself yet again and enter Moxie Fab’s Make An Itty Bitty Card Challenge . I downloaded this cute tree card from Silhouette, sized it to just under 3 inches, added a Happy Tu B’Shevat and cut it out of Kraft cardstock on my Cameo. I cut the tree trunk out of wood grain cardstock and adhered it to the top of the card. 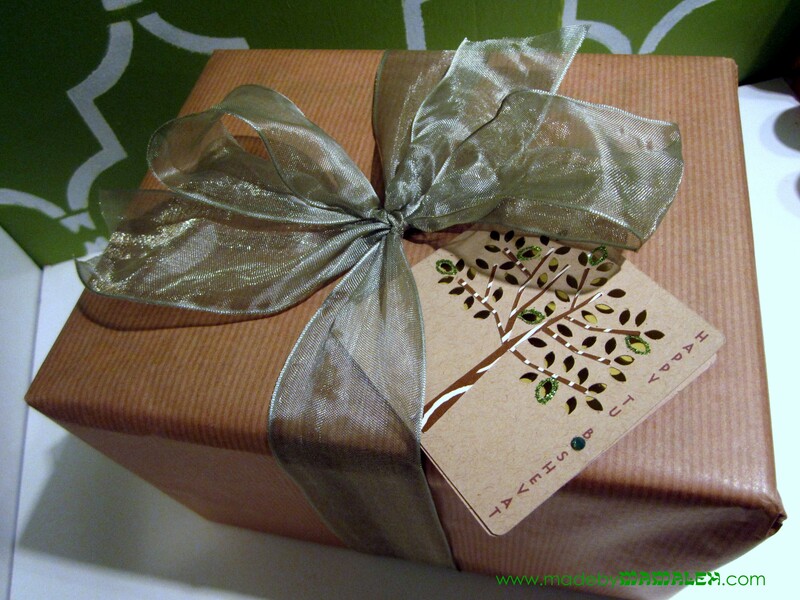 Then I lined the card with a scrap (cut in the same rounded square of the card) of Paper Source Chartreuse green cardstock to show through the leaves. Instead of an apostrophe for B’Shevat, I attached a sparkly green Swarovski crystal. Finally, for a little extra sparkle, I outlined several leaves using my glue pen and some lime green ultra fine glitter. 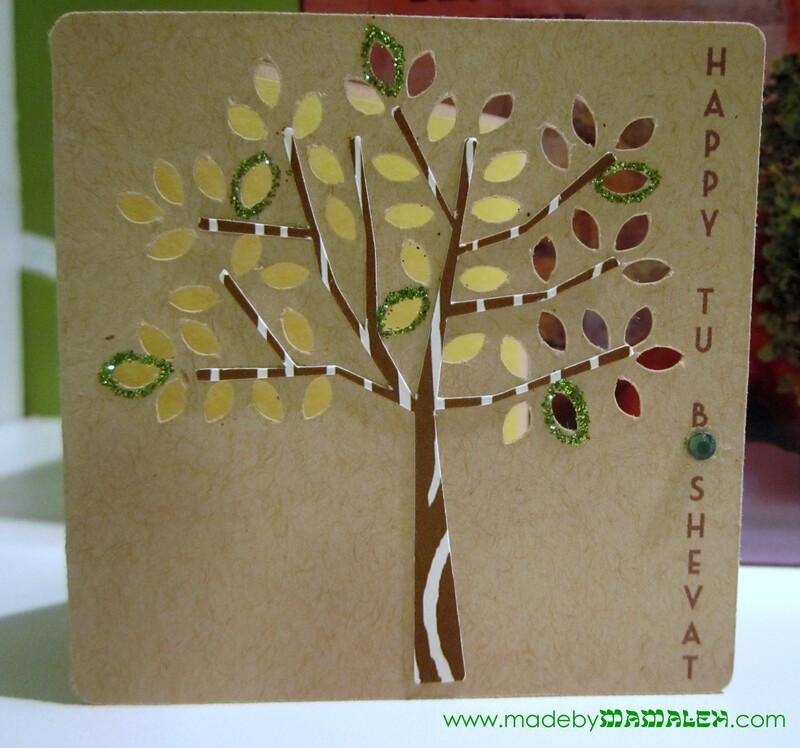 Teeny Tiny Tu B’Shevat cuteness at just 2.8″ square! It was a total surprise and she loved it! Have you ever had a chia pet? What was it? This entry was posted in Challenge, Gifts, Handmade Card, Random Acts, Tu B'Shevat and tagged handmade card, random acts of kindess, Tu B'Shevat. Bookmark the permalink. It was an awesome surprise! !